As we learned last week, the BMW M3 Coupe is no more. Dead. Kaput. Gone the way of the dodo bird. 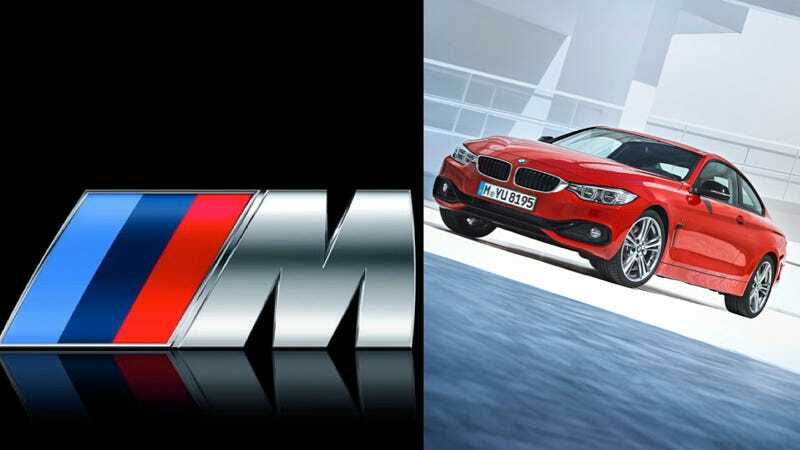 In its place is the M version of the 2014 BMW 4-Series, likely to be called the M4. And a BMW executive shed some new light on that car in an interview with Top Gear. Matt Collins, BMW's product manager for small and mid-sized cars, confirmed one big detail to Top Gear that we had suspected about the M4: namely, that it will have turbocharged power. Collins, however, declined to comment on exactly what kind of engine it will have, although the prevailing wisdom is that it will be a turbocharged inline six to slot below the new M5's turbo V8. Turbo power will be a first for the M version of the 3-Series coupe, which has carried everything from a small inline four to straight sixes to the V8 in the outgoing model. "I can say it will be a turbocharged engine. From an emissions perspective, but also because our turbocharging technology is sufficiently strong, that you can still deliver a very good, high performing engine and the kind of driving dynamics that people are used to." He points to the latest versions of the M5 and M6, both sporting a monster 560bhp 4.4-litre twin turbo V8. "How did people accept those cars? Maybe there was some initial apprehension, but the owners of new M5s and M6s told us they appreciated the increase in power (of a turbo engine) and the higher levels of torque at lower rev ranges." Collins also went into some detail about another important aspect of the M4: compared to the E92 M3, it's going to lose a bunch of weight. He even says it twice! "What we'd like is more focus on lightweight engineering," he says. "The philosophy will be around delivering performance through improved used of materials - lightweight alloys, lots of carbon fibre etc - rather than simply trying to make the engine more powerful to move the same kind of car, or scaling it back too far so that it loses its M3 roots. "We really want to focus on lightweight engineering. Plus we've got the technology in our ‘i' cars - carbon fibre, reinforced plastic and so forth - so that's where we're really looking to position it. Slightly more lightweight. I wouldn't say ‘racer', but more of a dynamic focus." That's good news. The E92 M3 is a thoroughly badass performance car, but it's not a lightweight by any means. That its successor will lose some pounds is nothing but good news from the standpoint of driving dynamics as well as fuel economy. Collins also confirms that the new car will be called "M4," and he acknowledges that losing the M3 name — at least until we get a sedan version, which could happen — is a huge decision for the brand. He says it's a big responsibility for them to pull off correctly, which is why they won't be rushing the car out. I don't know. I have a weird theory that when the car comes to market, BMW will chicken out at the last moment and call it the "M3 Coupe" or something. Never mind the fact that it's based on the 4-Series; lately, they've taken to calling their cars whatever the hell they want, like 1-Series M Coupe, X6M, or 6-Series Gran Coupe. I could be wrong, and I acknowledge that there's like a 10 percent chance of that happening, or less. I would just be surprised if they ditched the M3 name and all the cachet that comes with it. Calling the M version of the 4-Series the "M3" wouldn't make any less sense than what they've done so far. What are your hopes for the new M4?